General Purpose Simulation System (GPSS) is a special computer programming language primarily used to simulate what can be classified as discrete systems. A discrete system is one where, at any given instant in time, a countable number of things can take place. The basic operation of a mine itself can be considered such a system. Discrete Simulation and Animation for Mining Engineers explains how to model mining systems using GPSS/H® and PROOF® by Wolverine Software Corporation. Employing a unique approach that encourages engagement from the start, the text discusses animation first, and then slowly introduces simulation language. As each new topic is covered, an animation is provided to illustrate the key concepts. 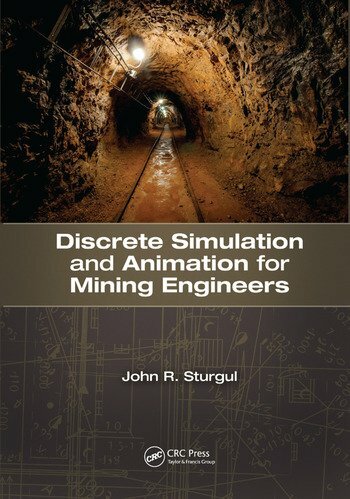 Written by a mining engineer for mining engineers and students of mining, Discrete Simulation and Animation for Mining Engineers offers a comprehensive yet accessible treatment of mine simulation and animation useful in increasing the efficiency of industrial mining processes. John R. Sturgul holds a BS in mining engineering (with honors) from Michigan Technological University, Houghton, USA; an MS in mathematics from the University of Arizona, Tucson, USA; and a Ph.D in mining engineering from the University of Illinois at Urbana-Champaign, USA. He also holds an honorary doctorate from the University of Petrosani, Romania. Recognized as the world’s leading authority on the application of discrete system simulation to mines, Dr. Sturgul is currently a professor of mining engineering at the University of Adelaide, Australia. He has been actively engaged in mine simulation and animation for more than 30 years. His work in this field has taken him to more than 60 countries and earned him numerous awards in Chile, Romania, the United States, Spain, Argentina, Peru, South Africa, Greece, and Australia, where he received the Ray Page Lifetime Achievement Award from the Australian Simulation Society. His model of the Lihir gold mine, located on an island northeast of Papua New Guinea, was the first example of a mine initially designed using a simulation model. He published the first textbook on the subject in 2000, and now this new textbook explains the details of constructing such models. "… essential reading for those mining companies thinking of improving, innovating and generally increasing their production – or at least finding where the bottlenecks are. … very detailed and lays out the methodology for developing solutions to typical mining problems – truck/shovel interactions, truck haul cycles, queuing at dumps/hoppers/shovels – the bread and butter of cost reduction in mining." The book has the perfectly recognizable "Sturgul style". … very well written book, specially entertaining and educational, but complete and professional at the same time. Anyone who wants to learn about simulation in mining should read this book. It is fantastic for students, but professional mining engineers at work will also find "precious ore" in the book to solve their real life problems." "… an interesting book to introduce new users in the computer simulation word. It clearly states the benefits of computer simulation and how it helps to answer questions about how different parameters values or small/big changes in the system can affect the final performance." "Easy to read and understand. … presented in the style that Dr. Sturgul would use in any of his Mining classes. … step-by-step instructions are easy to follow." "… aimed at giving the reader profound insights into the simulation of discrete mining systems. Having many years of experience, Sturgul uses an entertaining and interactive approach to teaching simulation. Readers will enjoy solving real-life problems using the knowledge gained from reading this book." "Highly applicable in the real world, very descriptive, easy to follow, and peaks the interest of the user yielding a double benefit. With this book the student is likely to both become interested in the industrial mining process while at the same time learn about it. … an excellent tool to get students to understand and apply simulation in the mining process." "… knowledge worthy for all mining industry students and professionals. The presentation is flawless and exhaustive for both students, beginners, and practitioners of mining simulation and has a place in the history of cutting edge mining applications." "I would recommend current and future mining engineering students to read the book and try out the exercises, even if your university does not have a dedicated course on the subject. These skills will only enhance your presentations and skills base. For more experienced engineers, these tools can be a great help, even at later stages within a mineral industry career."